This morning I took a look at the front page of Café Royal Books, a small independent publishing house based in Southport, England originally set up in 2005 by Craig Atkinson as a “way to disseminate drawings and photographs, in multiple, affordably, quickly, and internationally without relying on ‘the gallery’“. The publications usually present a series of images by a single photographer on a single project. It may be the work from a single event or representing a much longer project. CRB has produced some larger works, but these weekly publications are generally between 24 and 40 pages, more a zine than a book, with the aim of building up a comprehensive survey of the area of work. Some photographers are represented by quite a few such volumes, in some cases more than 20, while others have preferred to stop at a single issue. Among the photographers who have already had issues published are some very well-known names – including Martin Parr, Jo Spence, Daniel Meadows, Brian Griffin, David Hurn, Victor Sloan, Chris Killp, Paul Trevor and others, but some of the best books are by people you may well never have heard of. Ian MacDonald — Greatham Creek 1969–1974 and Janine Wiedel — Chainmaking: The Black Country West Midlands 1977, each worth a look, and you can page through them on the web site. Another recent title is John Benton-Harris — The English, where I have to declare an interest, as I helped John translate his ideas into digital form. It’s a great introduction to the work of this photographer who came to London to photograph Churchill’s funeral and stayed here as one of our most perceptive observers – and was also largely responsible for the seminal 1985 Barbican show ‘American Images 1945-80‘, providing most of the ideas and contacts and doing much of the legwork for which others were rather better at taking most of the credit. But the déjà-vu? It came on the back cover of a book by another US visitor to this country, Diane Bush, who was here from 1969 for ten years, becoming a part of the Exit Photography Group with Paul Trevor and Nicholas Battye which produced ‘Down Wapping‘. 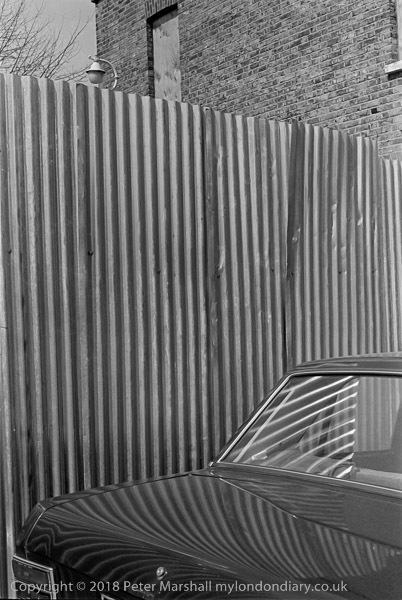 On the back cover of her ‘The Brits, England in the 1970s’ was a picture of a car parked in front of a fence, using the reflections of that fence. It isn’t the same car nor I think the same fence, nor quite the same treatment, but I immediately thought of my picture when I saw hers. I don’t think there is much possibility that I had seen her picture when I took mine, but have a nagging suspicion that somewhere, by some photographer, is a similar image that we both had seen before making our pictures. This entry was posted on Thursday, July 19th, 2018 at 10:50 am and is filed under My Own Work, Photo Issues, Photographers, Reviews etc. You can follow any responses to this entry through the RSS 2.0 feed. You can leave a response, or trackback from your own site.